"This game, which seems simple at first, is given a 4/5 rating, because it is very creative and unlike many puzzle games already out there. This trial version is fun for adults and children, so the full version is definitely worth purchasing. Just a warning for the physics lover: You may become addicted to this game!" "Teenagers and adults will enjoy the challenge of applying their knowledge of physics to complete levels." "Young children will enjoy watching older children or adults play, because the game uses fun graphics and tools made from toys, such as legos, bats, balls, blocks and teddy bears." ...sorry that's all I can confirm for the time being. 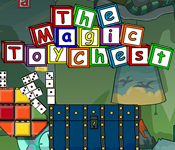 The posts have been slowing down, but we are very busy working on new things for the Magic Toy Chest. Keep a look out in the coming months!